Jeffco offers an assortment of task chairs and stools that match our Quick Made-to-Order Seating. Chairs are pictured in Wallaby Black and Wallaby Grey. 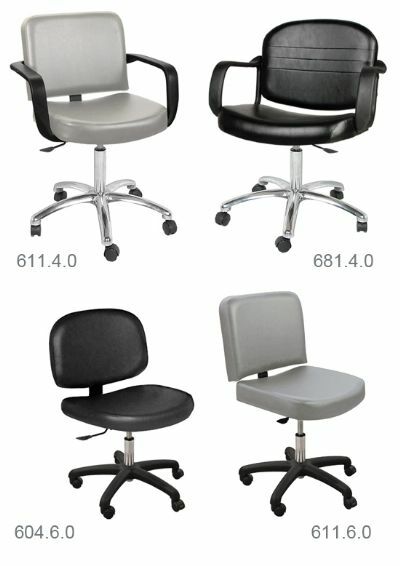 Task chairs all feature black urethane arms and a die-cast aluminum base, casters & gas lift w/ 5" height adjustment. Seat height adjusts from 18" to 23" from floor. Manicure & utility stools feature a pneumatic cylinder w/ 5" height adjustment with black base and casters. Seat height adjusts from 18" to 23" from floor. In-stock stools can be found here.